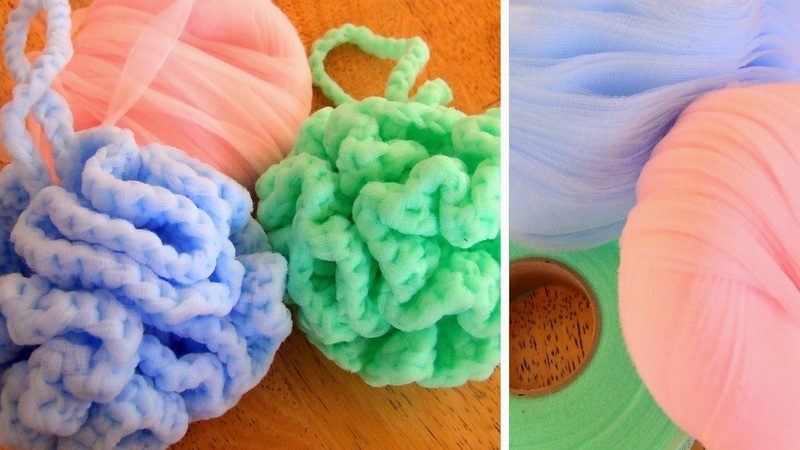 There are plenty of unconventional materials used to crochet, such as rope, wire, and t-shirts, but oftentimes to use these items you have to prep them yourself, which can be a bother. 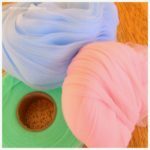 With the rise of creative uses for crochet and the need for more unconventional materials, however, there has been an upswing in new types of acrylic yarns, such as Knitlon, which is made up of 100% nylon knitting ribbon. What’s that mean? Simply put, it’s an already woven ribbon made up of nylon, useful for weaving, knitting, and crochet. A bonus side effect to using nylon means it dries quickly, which makes it perfect for the following crochet body scrubber, unlike some conventional materials such as wool (and even cotton, which takes longer to dry). FitzBirch Crafts has created a free crochet pattern for you to make your own personal scrubbies using Knitlon, and it’s a perfect project for a beginner, since it only requires the use of three stitches: chain (ch), slip stitch (sl st), and double crochet (dc). You’ll need some Knitlon in your color of choice (pastels are always a good option) and a 5.5mm crochet hook, plus some scissors to complete this project. The result is a cute bathroom scrubbie perfect for the guest bath, or as part of a gift basket, or as a little treat for yourself. With how quickly these work up, you could make several in no time. If you’re interested in trying out this free pattern, you can find it at FitzBirch Crafts. Check out their other free patterns as well – they’ve got everything from clothing (wraps, shawls & scarves), to accessories (hair comb, brooch), to housewares (covers, table mats, etc.) and more. You can also find and follow them on their various social media pages on Facebook, Pinterest, Instagram, and Ravelry.